The Lodge was named in a traditional ceremony by Chief Ian Campbell, the Hereditary Chief of the Squamish Nation on whose territory the Lodge was built. The Chief tells the story that “Skwachàys” is the traditional name of this area which is located at the head of False Creek. It refers to the spring waters that once covered the area. The area was rich in elk, bog cranberries, wild rice, sturgeon, and salmon. The Squamish people believe that these waters are a portal into the spirit realm and are sacred. Retaining this name supports the ancient history and connection to the area. 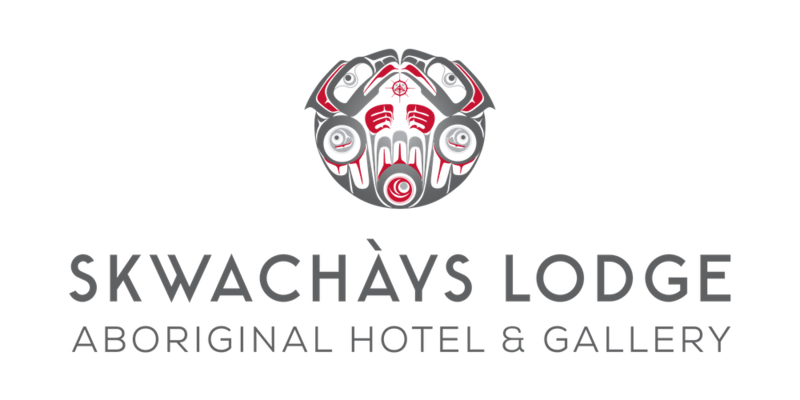 The Skwachàys Lodge logo is derived from an original work created by Eric Parnell, A Haida artist living in Vancouver. The original work was created for the ‘Looking Forward, Looking Back’, that was a story catching project that looked at Vancouver’s Eastside through the eyes of Indigenous artists. Eric chose to represent the idea of forward and back reflection with duplicate Ravens looking inwards and facing each other. The Ravens rest within a circle containing two human hands beneath a stylized sun, giving one a sense of holding the reflection in the light of these two views.